“Solar power rose to record prominence in 2017,” according to REN21’s 2018 Renewables Global Status Report. A total of 98 gigawatts (GW) of new solar power generation was installed worldwide last year, exceeding by far the combined total of newly installed coal, natural gas and nuclear power generation. Overall, new solar power generation accounted for 38 percent of a worldwide total 157 gigawatts (GW) of renewable energy capacity additions in 2017. That’s up from 143 GW in 2016. 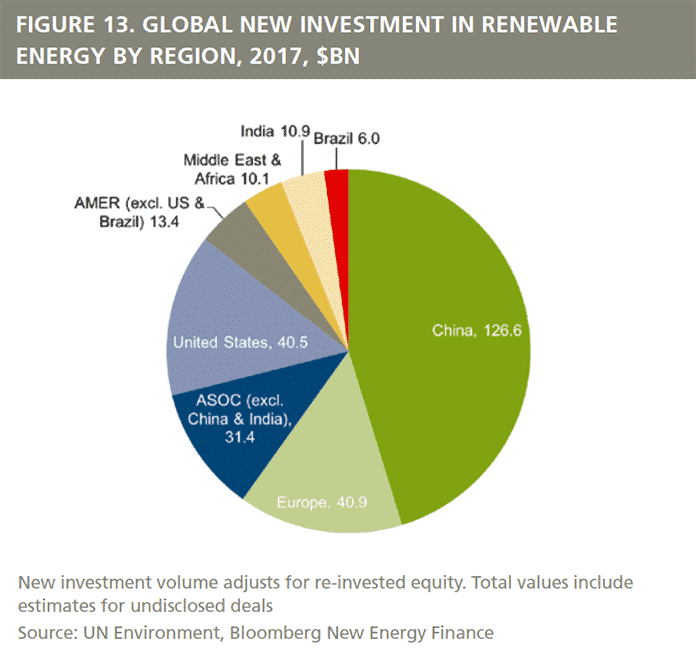 China led the world when it came to renewable energy investment in 2017, accounting for 45 percent of the global total – $126.6 billion. Solar deployments boomed in China last year as some 53 GW was installed – more than was installed worldwide as recently as 2014 – and total solar investment in China surged to reach $86.5 billion. “We were surprised, to be honest. We expected growth in China to be strong, and by and large it has, and it has been consistent. But it was unexpectedly strong this past year,” said Frankfurt School-UNEP Center’s Ulf Moslener, the lead editor for REN21’s 2018 report. “Such continuous growth was surprising to us, so the question became what really happened. It turns out there was a strong push by government, particularly with regard to solar. Climate, as well as other environmental issues – air quality and pollution – were also strong drivers apparently,” Moslener explained in an interview. Adding to this were industrial level issues. “Basically, electricity demand is rising fast such that expansion of solar installation increased faster than planned,” he continued. REN21’s report authors were also surprised that Chinese regulators didn’t step in to moderate the rapid growth. “It may be that no regulatory action was taken simply because the need for electricity was growing so fast. Apparently, there were instances where investors invested to build new capacity even without assurance of the same level of government support, circumstances that are a bit risky,” Moslener told Solar Magazine. 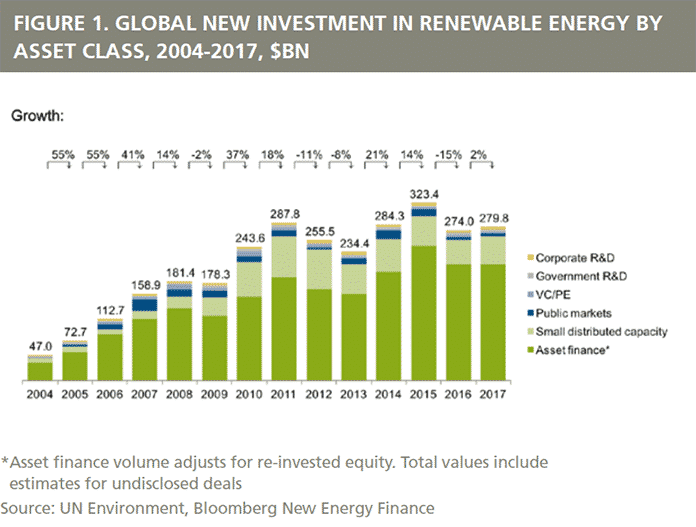 In other major national markets, policy uncertainty led to a year-over-year decline in renewable energy investment in the US in 2017, where a total of $40.5 billion was invested, down six percent from 2016. Total renewable energy investment declined in Europe as well – dropping 36 percent year-over-year to $40.9 billion. A sharp, 65 percent drop in 2017 UK renewable energy investment, to $7.6 billion, was the main driver, according to REN21’s 2018 Renewables Global Status report, which was produced by United Nations (UN) Environment’s Economy Division, Frankfurt School’s UNEP Collaborating Center for Climate & Sustainable Energy Finance and Bloomberg New Energy Finance. There were several reasons for 2017’s decline in renewable energy investment in Europe and the US, according to Moslener. One is simply a matter of the relationship between the dollar value of capital invested and declining costs per Watt. “As prices for wind and solar go down, investment volumes, in dollar or euro terms, go down as well, simply because you can install the same amount of capacity for less. That makes China’s performance all the more impressive,” Moslener explained. Another contributing factor was the struggle on the part of European governments to cope with and better manage the rapid growth of renewables over the past decade. That led to the elimination, scaling down and/or reformulation and recalibration of incentives. Market participants need time to adjust to the shifting regulatory environment and market mechanisms. In leading European solar markets, such as Germany, that includes a shift away from feed-in tariff to renewable energy auctions. Furthermore, in developed markets, such as the European Union and US, solar, wind, biomass and other renewables have to compete with, and threaten, utility investments in legacy coal, as well as natural gas and other fossil fuel, power generation, Moslener pointed out. 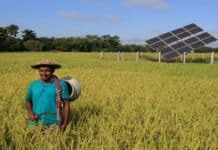 In contrast to the 20 percent, year-over-year decline in developed markets, renewable energy investment in developing countries (including China, Brazil and India) jumped 20 percent higher last year, to $177 billion, accounting for just over half of 2017’s global total. The difference was the largest seen since developing countries’ annual renewable energy investment exceeded that for developed countries in 2015, the report authors highlight. “In Germany, there’s enough capacity to meet demand, but that’s not so in China, for example. There you can invest in renewable generation without having to worry about shutting down existing coal or other legacy generation capacity. It’s easier to grow in markets such as China,” Moslener said. The challenge in developed markets isn’t the level of subsidies any longer so much as the structure and market mechanisms employed to govern and guide the allocation of capital in energy markets, Moslener continued. In sharp contrast to fossil fuels, solar and wind energy technology have zero marginal fuel costs, he noted. “It really comes down to finding ways to open energy markets up so that the full value of renewables with zero marginal costs of production can be realized, but also ensure they are open and attractive to generation that provides stable, continuous power,” Moslener explained. “Geothermal is renewable and it’s useful as a continuous source of power generation, which helps in terms of grid stabilization. But it’s not available, or practical, in many countries on a wide scale basis,” he pointed out. As the technology becomes cheaper, end users can use the electricity themselves. That’s a major driver in terms of project cash flows – it’s not only how much you can produce and sell to the grid via battery energy storage capacity, but how much you can save by not having to buy electricity from the grid. The question of just how much energy storage capacity would be needed arises in utility service territories which have load shedding capabilities in place. In such cases, the availability of cheap battery storage becomes less important, Moslener pointed out. That’s the case in developed markets. Battery energy storage, often in combination with solar PV generation, is also growing in developing markets, as well as on islands, in remote locations and anywhere where grid power is poor, exceedingly expensive or unavailable. “Batteries are a key even for smaller grids, as well as for households and businesses,” Moslener said. 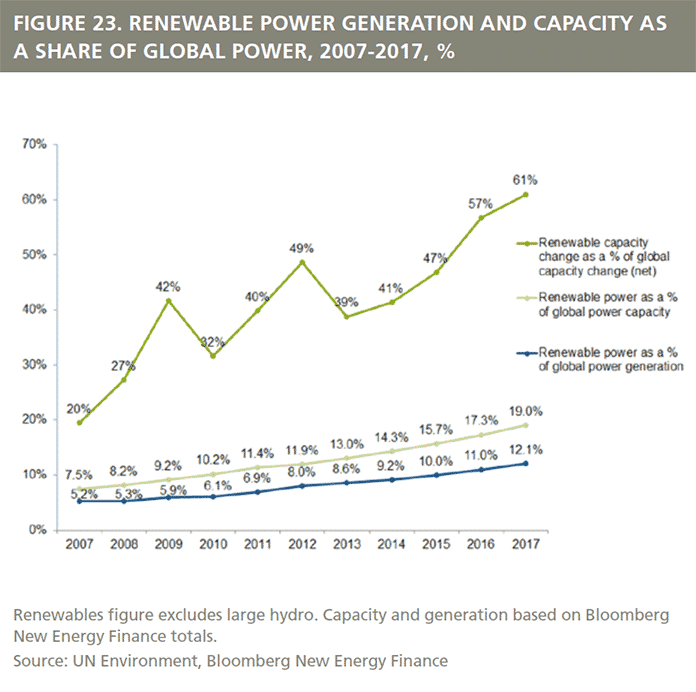 Overall, renewables (including hydroelectric less than 50 MW in capacity) generated 12.1 percent of the electricity produced worldwide in 2017, according to REN21’s third annual global trends report, up from 11 percent in 2016. Bids to build out new renewable power generation during national auctions continued to decline, setting new record lows. 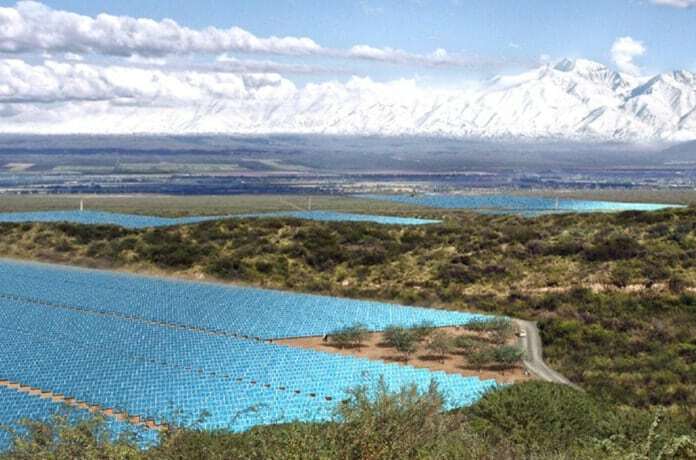 Project developers’ bids to build out new solar power generation in Mexico this past November averaged $20.80 per megawatt-hour (MWh), while that for onshore wind averaged $18.60 per MWh, the report authors point out. The falling cost of building new solar power generation stood out amid a broad-based decline that spanned the renewable energy sector. The levelized cost of electricity (LCOE) for a utility-scale solar power project dropped 15 percent year-over-year in 2017, to $86 per MWh. Lower capital costs and increasing efficiency contributed to the decline. Zooming out for a longer term view, solar’s LCOE has declined 72 percent since 2009, according to the report. The average LCOE for solar PV without tracking and without subsidy came in at $54 per MWh. That compares to that for onshore wind at $51 per MWh, gas-fired generation at $49 per MWh, coal at $66 and nuclear at $174.5, according to REN21. 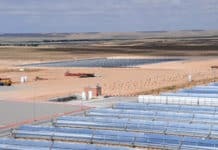 REN21 analysts note that any comparison regarding investment trends needs to take account of falling PV costs and rising energy conversion efficiency. 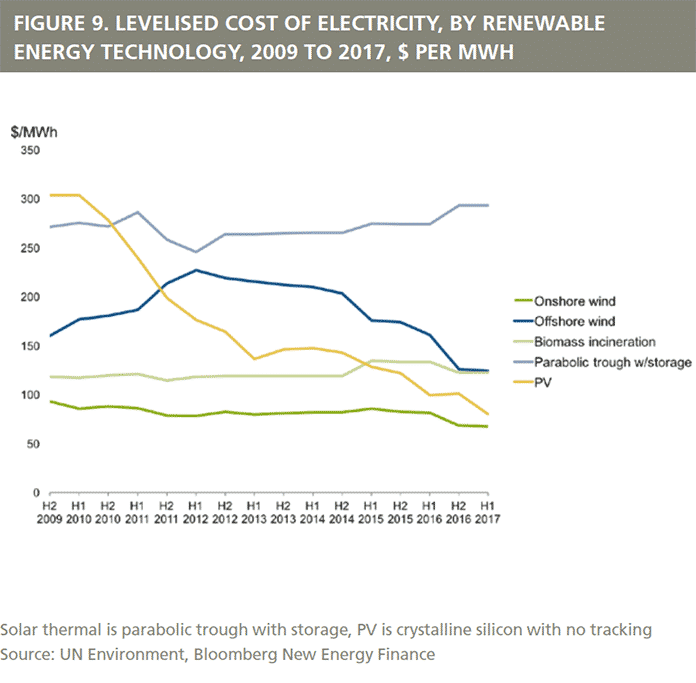 They point out that $1 invested in 2017 bought much more solar PV generating capacity than it did at the start of the decade. The average, per megawatt cost of building a new, utility-scale PV facility was about 25 percent cheaper in 2017 than two years earlier. Utility-scale solar PV project investment surged 20 percent, to $102.2 billion, in 2017, according to the report. Investment in solar thermal, aka or CSP, or concentrating solar power plants rose five percent year-over-year to $2.2 billion. 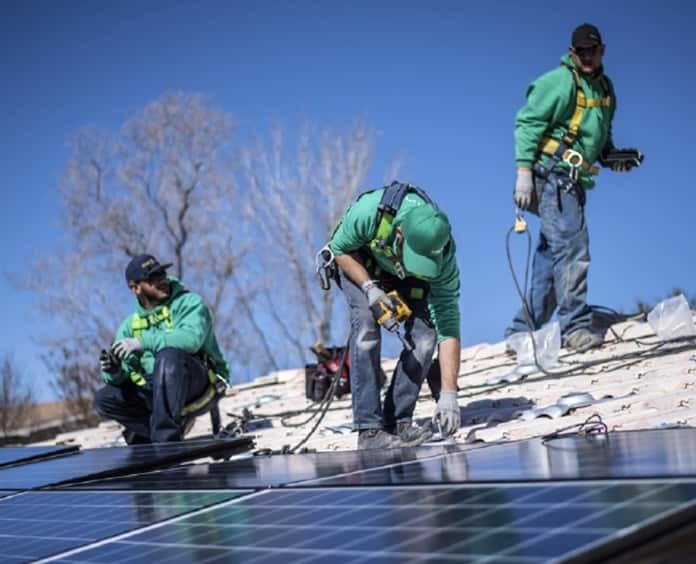 The cost of installing solar on a small-scale continued to decline as well. “In 2010, the average cost per Watt of a residential PV system in Germany was $3.90, but by the end of 2017 it had fallen 57 percent to $1.68,” the report authors state. The decline was even more pronounced in Australia, where the average cost per Watt of a 4 kW PV installation plummeted 78 percent, from $6.40 in 2010 to $1.40 last year, the report authors highlight. 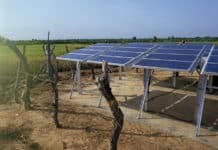 More broadly, global investment in small-scale solar projects (less than 1 MW) rose 15 percent year-over-year, rising to total $6.3 billion in 2017. REN21 estimates $49.4 billion was invested globally last year in building out 28 GW of new, small-scale solar PV capacity, up from $43.1 billion in 2016. 2017’s total fell short of growth rates from 2010-2015, however, the report authors point out. Annual average small-scale renewable energy investment totaled $63 billion over the five-year period, peaking at $75.2 billion in 2011. New, small-scale PV capacity declined in the US following a decade of growth. On the other hand, growth rates picked up in Pakistan’s nascent small-scale solar market, and an investment boom was taking shape in South Korea. REN21’s analysts go on to highlight ongoing development and rapid growth of mobile, “pay as you go” solar across a growing swath of the developing world. A widening range of investors have plowed more than $800 million into the fledgling market sector since 2013, according to Bloomberg New Energy Finance. The report authors single out Kenya-based M-Kopa Solar raising $80 million in debt capital from a consortium of development banks, impact investors and local bank Stanbic Holdings in October 2017 as an illustration of growing investor confidence and legitimacy of mobile, pay-go solar as a developing market solar asset class. Furthermore, “[b]y denominating as much as 69% of the debt in Kenyan and Ugandan shillings, M-Kopa was able to shift the currency risk to its lenders and simplify the transaction,” they note. The World Bank and International Finance Corp.’s Lighting Global initiative estimates the off-grid solar sector – ranging from solar lights to plug-and-play home kits and do-it-yourself systems – is worth $1 billion per year in sales revenues and will grow eight-fold by 2022. Pay-go solar home systems account for just $150 million to $200 million of this total, REN21’s analysts add. REN21 market analysts zoom in on national solar energy policy as a primary, determining factor in solar energy growth. 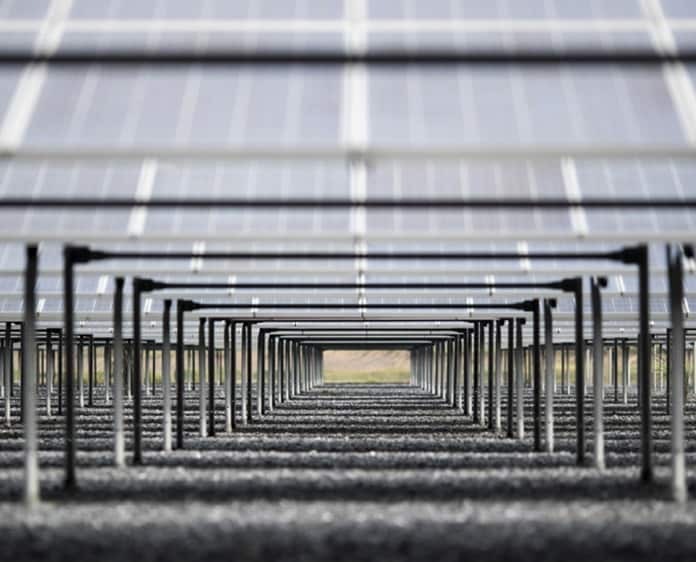 The imposition of global tariffs on imports of crystalline silicon photovoltaic (PV) cells and modules by the US cast a dark cloud over the industry, as did uncertainty regarding scaling down of the US federal government solar investment tax credit (ITC). That said, the average price of crystalline silicon modules in Europe fell 14 percent in 2017 and that is expected to drop a further 15 percent this year, according to pvXchange, an online market for solar components. “Prices varied for different types of modules and in different regions of the world, but the overall direction was downward,” REN21’s report authors state. Furthermore, analysts’ forecasts call for an average, global drop of 15 percent in solar PV module prices this year as more manufacturing capacity comes online. Policy and related market support mechanisms – feed-in tariffs, project auctions and power purchase agreements and the like – continue to play an important role in gaining and maintaining project investor confidence, REN21’s analysts highlight. They underpin projects by helping assure returns on investment and limiting risks, as well as indirectly boosting confidence among project lenders and financiers. Globally, auctioned renewable energy capacity completed and announced in 2017 reached a record high 50.6 GW, up from 33.6 GW in 2016, for example. Project bids dropped to historic market lows. Furthermore, 2017’s total of auctioned renewable energy project capacity represents somewhere between $30 billion and $50 billion worth of investment, REN21 estimates. The report authors zoom in on solar energy policy in China, the world leader in investment and solar equipment manufacturing, among others. “By encouraging development on a massive scale, China’s National Energy Administration hopes to drive down the cost of solar PV to the point where it becomes subsidy free, which will help tackle the burgeoning deficit in the country’s National Renewable Subsidy Fund,” they write. That’s expected to lead to a continuation of high growth rates in “behind the meter,” utility customer and off-grid solar PV capacity, the Chinese subsidy for which makes investing in small-scale, distributed solar particularly attractive. Addressing a more profound global issue, or pair of inextricably intertwined issues, underlies and fuels the drive to increase deployments of solar and other renewable energy resources as quickly as practicable: rapid climate change and environmental degradation. “Despite the progress of new technologies such as wind, solar, EVs and battery storage, the challenge for the world on emissions and climate remains as daunting as ever. In 2017, the amount of carbon dioxide in the atmosphere hit 406.5 parts per million, up 2.3ppm since 2016, and 37ppm since the year 2000,” REN21’s report authors highlight. Furthermore, statistics regarding global temperature revealed that 2016 was the hottest year on record since 1880. 2017 was the second hottest. Moreover, “NASA’s combined land surface, air and sea-surface water temperature index shows 2017 being 0.9 degrees Celsius hotter than the 1951-1980 average globally,” they point out. That was exceeded only in 2016, which was 0.99 degrees hotter. The report authors also highlight that the International Energy Agency (IEA) estimates that total CO2 emissions increased from 23 billion metric tons in 2000 to 32.1Gt in 2015, a compound growth rate of 2.2%. IEA forecasts calls for the rate of CO2 emissions to begin increasing again this year and continue increasing thereafter, but at a much slower, 0.4 percent per year between 2016 and 2040.